Home › Greater scaup › Long-tailed duck - Clangula hyemalis. The long-tailed duck (Clangula hyemalis) is a medium sized sea duck belonging to the family Anatidae. The long-tailed duck species is distributed in Arctic coasts of North America, Europe and Asia. It is a rare visitor to the Indian Subcontinent. Clangula hyemalis Leach, 1819, was previously included in the genus Anas. It is the only living member of its genus, Clangula. The long-tailed duck is a medium sized bird and the male duck is larger than the female. The male bird measures 50 to 60 cm in length and weighs 650 to 900 grams. The female measures 35 to 45 cm in length and weighs 550 to 800 grams. The wingspan is 70 to 80 cm. The male has a elongated pointed tail. Its dark grey bill is crossed by a pink band. In winter the male has white head, neck and body with dark breast and cheek patch. In summer the head, neck and back are dark and the cheek patch is white. In female long-tailed duck the head is dark in the summer and white in the winter. The long-tailed duck species inhabit freshwater lakes, slow moving rivers, pools, coastal inlets, islets in fjords and brackish lagoons. The long-tailed duck species feed by diving. They are omnivorous and feed on aquatic plants, algae, grasses, seeds and fruits. They also feed on crustaceans, molluscs, marine invertebrates, insects and fish. The long-tailed duck breeding season is during May and June. They nest on the ground near water and the nest is hidden among vegetation. 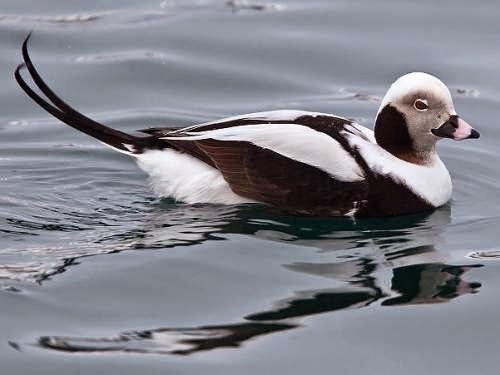 Breeding population of the long-tailed duck species is observed along the Arctic coast of North America, Europe and Asia. Wintering populations occur along the Asian and American Pacific coasts, Baltic sea, Black Sea and Caspian Sea. This long-tailed duck species is fully migratory. After the post-breeding moult, southward autumn migration occurs from September to October. They move in large flocks at night. The global population of the long-tailed duck is estimated to be 6,200,000 to 6,800,000 individual birds. Despite its large population and range, there is sharp decline of the wintering population in the Baltic sea. The species is threatened by wetland habitat degradation, drowning due to entanglement in the fishing nets, decline in breeding success, predation, skipped breeding and avian cholera. The species is susceptible to avian influenza. The IUCN (International Union for Conservation of Nature) has categorized and evaluated these duck species and has listed them as "Vulnerable". Current topic in Birds of India: Long-tailed duck - Clangula hyemalis.